Hoe we kunnen innoveren naar een duurzamer leven. In plaats van 130 op de snelweg en roken in de buurtkroeg. De ambtenaren, bestuurders, bedrijven en organisaties die aan duurzaamheid werken, moeten het programma voor het Klimaatcongres 2010 (17 november in Utrecht) wellicht nog even aanpassen. Want wat zijn de consequenties op lokaal en provinciaal niveau voor de plannen in het regeerakkoord voor meer asfalt, meer kerncentrales, 130 op de snelweg en roken in kleine cafés? De afgelopen jaren werden burgers gestimuleerd om steeds ‘groener’ te leven. Zo wordt de gloeilamp verboden en het rijden in zuinige auto’s beloond. Op die manier probeert de overheid de mensen bewust te maken dat een oplossing voor het klimaatprobleem niet alleen bij de industrie ligt, maar ook bij de mensen zelf. Of deze boodschap onder de politieke samenwerking tussen VVD, CDA en PVV overeind blijft, is de vraag. Voor wie wel weten hoe zijn levenswijze van invloed is op het klimaat, volgen hier de meest voor de hand liggende misdaden tegen het milieu die we iedere dag begaan, geformuleerd door David S. Reay (University of Edinburgh). In New Scientist zet hij vijf zaken op een rij die - als wij er ook maar een beetje bewuster mee omgaan - een aanzienlijke winst op kunnen leveren voor het milieu. In het Engels dus. Take coffee. Its vendors are in the vanguard of those promoting more “sustainable” products, with organic and fair trade options now widely available. Starbucks even boasts a programme it calls Shared PlanetTM programme - the irony of that trademark appears to be lost on them - which has the declared aim of minimising the company’s environmental impact and increasing involvement with local communities. That’s no bad thing, as far as it goes: fair trade can help to stop the exploitation of farmers, and buying organic may ensure more sustainable production techniques. But the average cup of black filter coffee is still responsible for 125 grams of CO2 emissions. Of this, two-thirds comes from production and most of the rest from brewing. Opting for the more prosaic joys of instant coffee reduces that figure to around 80 grams. Yet that still means a six-a-day caffeine habit clocks up more than 175 kilograms of CO2 each year. That’s the equivalent of a flight across Europe - from London to Rome, say. Add milk, and the methane belched by dairy cows means you increase your coffee’s climate-changing emissions by more than a third. The annual CO2 emission of a six-a-day coffee habit is equivalent to a single flight between London and Rome. It doesn’t end there, though. The environmental group WWF has calculated that it takes 200 litres of water to produce the coffee, milk, sugar and cup for just one regular takeout latte. So if everyone ditched their pre-work coffee fix that would do wonders for the planet. Then there’s toilet paper. Like coffee companies, loo paper manufacturers have long provided options for environmentally conscious consumers. Top of the list is 100 per cent recycled paper, which avoids much of the energy use and emissions associated with harvesting and processing new wood. Every kilogram of recycled tissue saves some 30 litres of water and between 3 and 4 kilowatt-hours of electricity. Since 1 kilowatt-hour of grid electricity is responsible for around 500 grams of CO2, that means a saving of 1.5 to 2 tonnes of CO2 per tonne of tissue. Recycled toilet tissue is most widely used in Europe and Latin America, but even there it still only accounts for 1 in 5 rolls. In the US it remains very much a niche product. The average American gets through 23 toilet rolls each year, adding up to more than 7 billion rolls for the country in total. 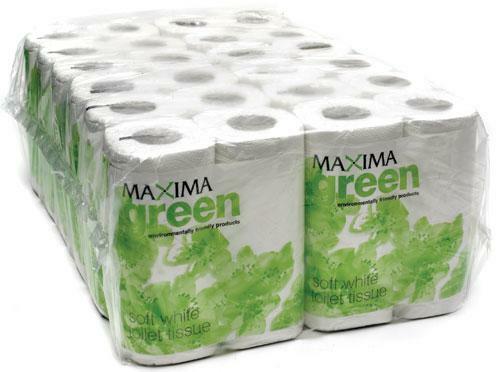 Of these, just 1 in 50 are from 100 per cent recycled fibres. As Greenpeace pointed out earlier this year, this not only wastes energy and water, it also puts additional logging pressure on old-growth forest in North America, forests which play a vital role in supporting native biodiversity. The reason toilet roll made from new wood is preferred is quite simple: its long fibres produce the softest and fluffiest paper. Every time paper is recycled, the fibres become shorter, making for an increasingly rough bathroom experience. Recycled paper can’t compete on softness so some use of new wood by the toilet paper industry may be inevitable. Sourcing Forest Stewardship Council (FSC) approved toilet tissue will help to ensure that any new wood fibres that are added to the mix have come from sustainable forestry projects that protect, rather than threaten, old-growth forest ecosystems. Next on my list of everyday decadence is fast fashion. In 1990, global textile production stood at 40 million tonnes. By 2005 that figure had risen to around 60 million tonnes. This surge in manufacture and consumption has been helped by fast-moving fashion trends and sweatshop price tags. As a result, much of the clothing we buy ends up being discarded long before it has worn out. In the UK, where the average item is worn for less than a third of its useful lifespan, more than a million tonnes of clothing are thrown away each year. The bulk of it ends up buried like woolly lasagne sheets in landfill sites or being used as multicoloured incinerator fodder. Even the global economic crisis appears to have had little impact on our love affair with fast fashion; UK clothing sales this summer were up 11 per cent on the same time last year. If we can’t entirely kick the habit, we can at least dispose of the evidence in a greener way. At present, in the UK and US, only around a quarter of unwanted textiles are reused or recycled. Recycled textiles have many uses, from mattress fillings and upholstery to bags and shoes, but the truly green alternative is reuse. The energy required to collect, process and sell a reused item of clothing is only 2 per cent of the energy required to manufacture a new garment. Every kilogram of virgin cotton preserved by reusing second-hand clothing saves 65 kilowatt-hours of energy, equivalent to about 32.5 kilograms of CO2. For polyester, the savings rise to 90 kilowatt-hours per kilogram. The clothing and textile sector in the UK alone is responsible for more than 3 million tonnes of CO2 emissions each year. Switching to second-hand alternatives could therefore yield some big energy savings and cuts in greenhouse gas emissions. Fast fashion has created textile mountains in many homes, yet the environmental cost of this excessive consumption has an even less conspicuous twin: the energy used to launder it all. Cleanliness has become a touchstone of domestic life since advertisers convinced us that our shirts must always be “whiter than white”, our sheets should forever smell of spring flowers, and that to be dressed in freshly laundered clothes at all times is a badge of success. We live in a “wear once and wash” culture. In fact, only about 7.5 per cent of the average laundry load in the UK is thought to be heavily soiled. Much of the rest is made up of items that are stuffed into the washing machine simply because they are on the floor instead of in the wardrobe (Sustainable Fashion and Textiles by Kate Fletcher, Earthscan, 2008). This habit is shockingly wasteful in terms of water, detergents and energy. One study found that over 80 per cent of the CO2 emissions produced during the life cycle of a single polyester blouse arose from cleaning and drying it. The percentage can be even higher for items made of cotton, as they tend to require far more energy-hungry drying. It is easy to see how these emissions stack up. A full load in a washing machine uses around 1.2 kilowatt-hours of electricity per cycle and tumble drying clocks up a further 3.5 kilowatt-hours, resulting in over 2 kilograms of CO2 emissions per wash. With four or five loads per household per week, the total annual emissions from each home can easily pass the half-tonne mark. That’s a significant proportion of the 10-tonne annual emissions of the average European. Line drying, washing at lower temperatures and ensuring full rather than partial loads will all help to reduce laundry emissions. For the largest cuts, simply washing less frequently is the way to go. Of all the facets of overconsumption that plague both human society and the global environment, food wastage is the most shocking. US households throw away around 30 per cent of their food, worth $48 billion every year. Similar levels of wastage are seen in Europe. In the UK, some 6.7 million tonnes of food is binned annually. Most of this joins the layers of unwanted clothing in landfill sites, where it decomposes, emitting the powerful greenhouse gas methane. Potatoes top the pile, with 359,000 tonnes going uneaten each year. Bread and apples are not far behind. Meat and fish are next, accounting for over 160,000 tonnes, followed by 78,000 tonnes of cooked rice and pasta. A staggering 4.8 billion grapes go the same way, as do 480 million yogurts and 200 million rashers of bacon. The annual cost to UK consumers of all this waste is £10 billion and the cost to the environment is the equivalent of an extra 15 million tonnes of CO2 (The Food We Waste, WRAP, 2008; bit.ly/urUFj). The cost of food wastage reverberates down the supply chain, increasing requirements for storage, transport and packaging. But the biggest impact by far comes in food production. For almost all the food we buy, the bulk of its greenhouse gas emissions arise here. This is especially true for meat and dairy produce. For example, 40,200 tonnes of milk are wasted each year in the UK, adding up to the equivalent of 40,000 tonnes of CO2. This is comparable to the annual CO2 emissions of 10,000 cars, or of flying 30,000 people from London to New York and back. In their 2008 report, WRAP, the UK’s Waste & Resources Action Programme, examined just why people throw so much food away. The most common reasons were that the food had been left on plates after a meal, was out of date, or simply “looked bad”. WRAP is now running a campaign to reduce food wastage. It aims to promote better management of food at home by encouraging people to prepare the right amount of food, keep an eye on use-by dates, and store food in appropriate conditions. As consumers we should also think more carefully before we shop. Check what you have already got, make a shopping list and, most importantly, don’t do the weekly shop when you are hungry. mr. Marjon Vinck (1981) is van huis uit juriste en werkzaam in de verzekeringsbranche. Op dit moment is zij op zoek naar een nieuwe uitdaging.